When a product is being manufactured, it needs to be monitored for quality control purposes. One of the best ways to control the quality of a product is to make sure that each process that it has to go through is being implemented properly. With the use of this product quality control chart, any production manager or supervisor can keep track of how close each of those processes are coming to the target quality specifications whether they are there on-site to get the numbers or not. Each business survives on the basic principle of keeping manufacturing cost low while still producing a quality product that will continue to bring in revenue. 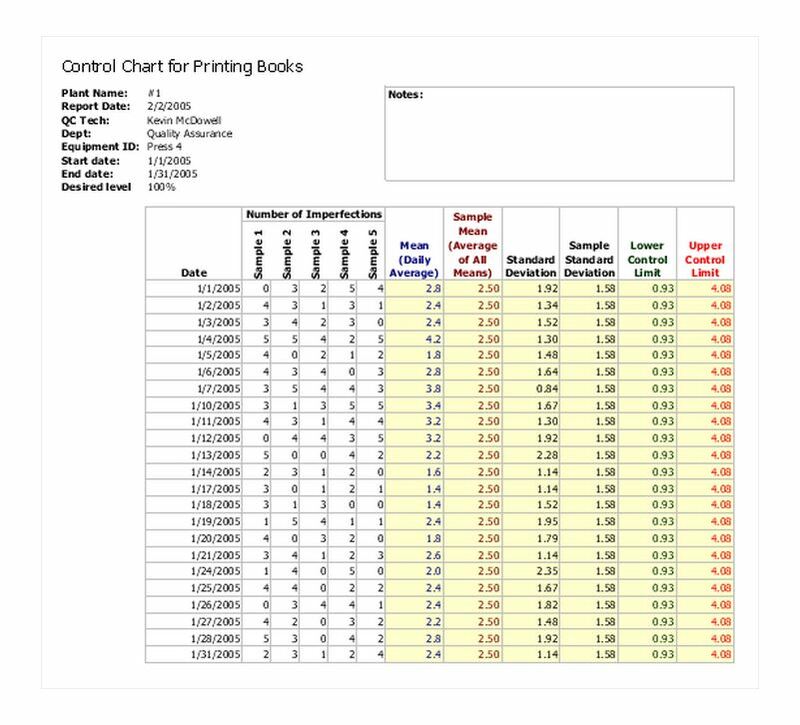 Using this customizable product quality control chart that is free to download and easy to use will allow any production manager to keep an eye on the amount of imperfections that is produced. This is a uni-variant control chart which allows it to be completely customizable to a specific quality control specification. The production manager or production process examiner can use the chart by simply inputting the daily imperfection data into the spreadsheet, then the numbers will be calculated and the average value along with the upper and lower control limit results will appear in the columns. The calculated numbers will then be graphically depicted to show whether the daily imperfections fall, as compared with the back drop of the upper and lower control limits, within those limits or outside of them. Thereby, allowing the chart user to automatically see which imperfections fall within control limits, without having to spend time doing all the calculations and then sorting through the results. Using this product quality control chart will save time and money by allowing management to see quickly what productions processes may need to be investigated to bring them back within control limits. Use the product quality control chart daily in order to set the initial quality of production specifications. Use the chart to monthly to monitor how consistently the quality control production process is performing. Use the chart to improve known problem processing areas even while being off-site. The chart can be used on-site or the numbers can be called in to a supervisor, who is off-site. Still allowing the supervisor to input the numbers into the chart and get the results.